Digital World Tokyo | Face recognition machines to stop under-age smoking - not! 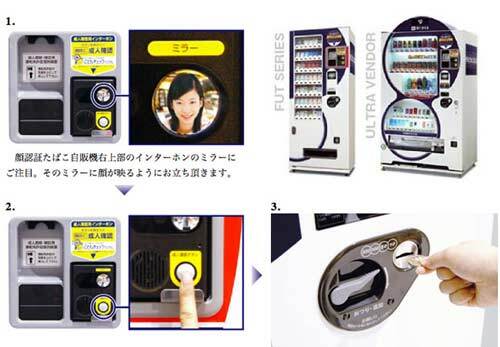 The bizarre state of affairs comes from a new Japanese cigarette-vending machine that uses face recognition to determine if a customer is over the legal age for buying tobacco, which is 20 in Japan. Fujitaka’s ‘Child Check System’ will start appearing in some of Japan’s half million or so machines from this July – that’s around the same time as the taspo RFID age-verification system we’ve seen previously. Eschewing pre-registered RFID cards, the Fujitaka system works by analysing a digital photograph taken by a camera embedded in each machine. A database of 100,000 faces allows it to look for the lack of lines and skin tone that suggest a minor is trying to buy cigarettes. There are, of course, plenty of people who look young well into their 20s and beyond. These folk can either insert a driving licence for age verification or register their mugs with the vending machine owner. Regardless of the smart technology behind the Child Check System, its chances of success look slim. As if to underline the problem, even though it hasn’t begun yet, the alternative taspo system has had a miserable pre-registration rate and suffered criticism from privacy advocates. Moreover, previous attempts at ‘face recognition’ using video cameras embedded in cigarette machines and linked to someone sitting in a room nearby (really) have been predictable flops. Any still to be found on the streets of Japan tend to have their cameras obscured by dark burn marks – made by cigarettes, of course.